NFL UP Notification is out. NFL UP is recruiting for 52 Accounts Assistant Govt Job Posts. You can check NFL UP - National Fertilizers Limited last date, download NFL UP notification, visit NFL UP official website and check other NFL UP Vacancy details.Complete Vacancy and recruitment Details about 52 Accounts Assistant Govt Job vacancies in NFL UP are provided below by JobSarkari.Com only for you. Last Date for Apply Online. 28/02/2019. Bathinda 04 01 01 00 06. Panipat 02 01 00 00 03. Vijaipur 05 01 01 02 09. Corporate Office, Noida 02 01 01 00 04. Marketing 15 09 04 02 30. Total No. of Post 28. 13. 07. 04. 52. Account Assistant Candidates Must Have Passed Bachelor Degree in Commerce (B.Com) with Minimum 50% Marks (Gen/OBC) and 45 % Marks(SC/ST/PH) in Aggregate. Age Relaxation. As Per Government Rules. 1. On Basis of Computer Based Test(CBT). Q. 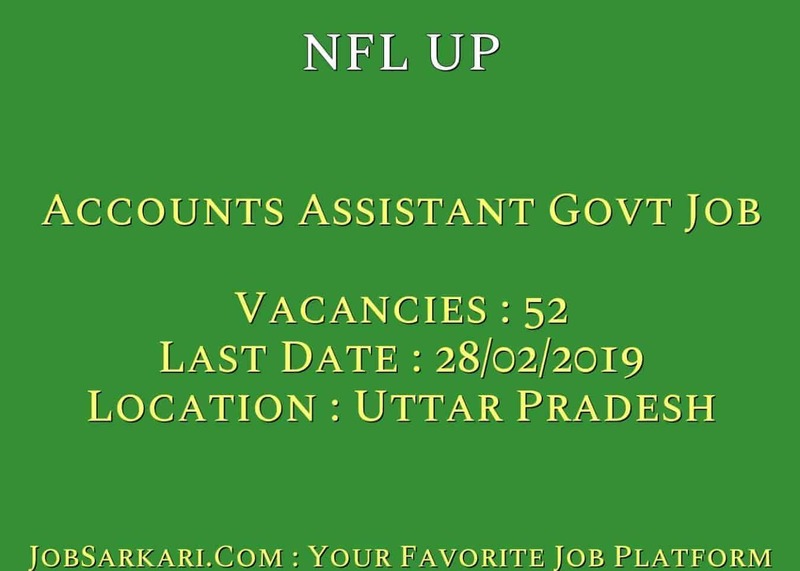 What is the Last Date For NFL UP Accounts Assistant Govt Job Vacancy ? A. 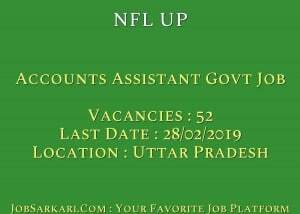 Last Date for NFL UP Accounts Assistant Govt Job Posts is 28/02/2019. Q. What is the Form Type of NFL UP Accounts Assistant Govt Job Recruitment ? A. The Form Type for NFL UP Accounts Assistant Govt Job Posts is Online. Q. How many vacancies are available in National Fertilizers Limited Accounts Assistant Govt Job Posts ? A. There are about 52 Vacancies in National Fertilizers Limited Accounts Assistant Govt Job Posts. Q. What is the Full Form of NFL UP ? A. Full Form of NFL UP is National Fertilizers Limited .